Lime Orange is a buzzy little Korean restaurant in Victoria, hidden away on Vauxhall Bridge Road. It’s pretty tiny inside and unassuming at first glance. However it is super busy (it was packed out the Tuesday we visited until about 9pm), which is the sign of a good place. Service was friendly and efficient with plenty of recommendations for top sellers and food arrived in a pretty speedy fashion. There is a small drinks menu, featuring a handful of traditional Korean drinks, a solo beer option, wines and a larger selection of soft drinks. We had a glass of the Trebbiano IGT Rubicone, Rometa (£4.95 for 175ml), a delicious white wine to compliment the fish, veggies and chicken. 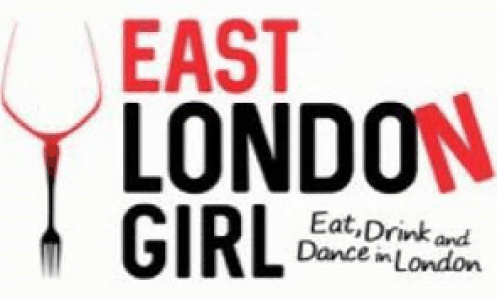 The menu has plenty to choose from, including a number of veggie options (and ones which can be altered to vegan) too, from from tofu udon, to kimchee bibimbap and vegetable mandu. We tried several of the top sellers and most popular options, recommended by the team. A true feast, as it all arrived at about the same time. 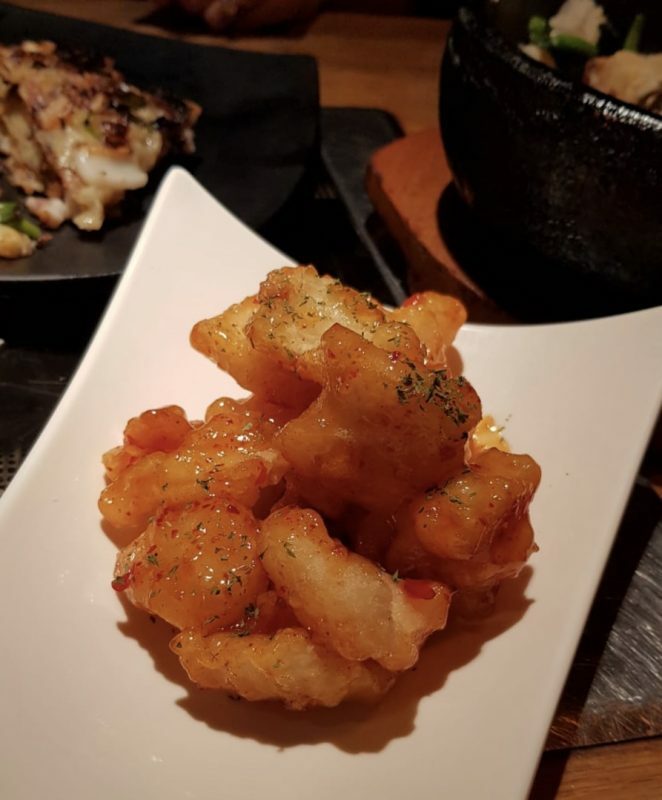 The spicy calamari (£6.90) was beautifully battered (not too much so), with a fab sticky sweet chilli sauce. A great side. The Pa Jeon (£7.40) was one of the best of the night. 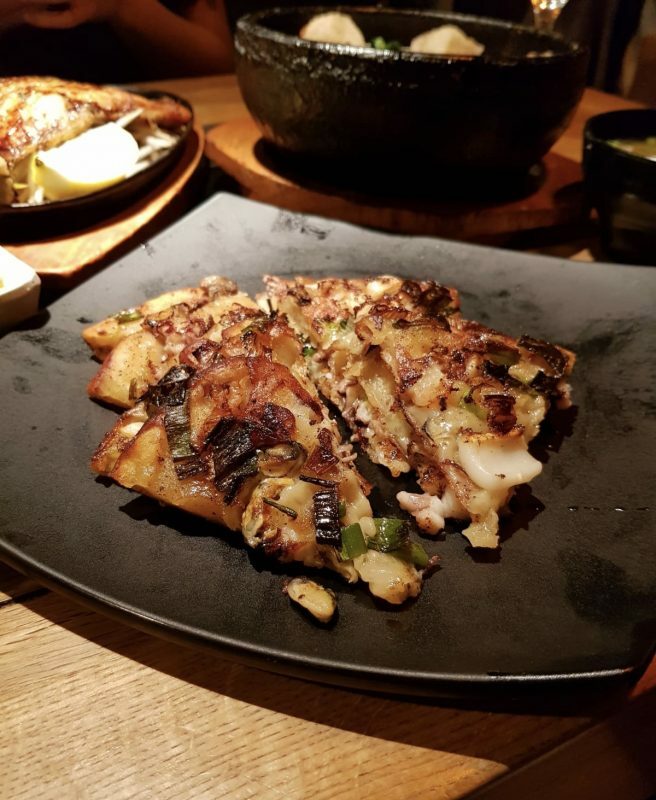 It’s a savoury Korean pancake, with seafood and spring onions. Served with a soy sauce and apple cider vinegar dip, it is seriously tasty! Think Spanish tortilla with substitutes for the potato and more of a Korean taste. Delicious! The Soy chicken (£7.70) was a great side/starter too. Deep fried wings tossed in sweet and tangy soy garlic sauce, they were crispy yet tender. Finished with sesame seeds, they were pretty darn good. 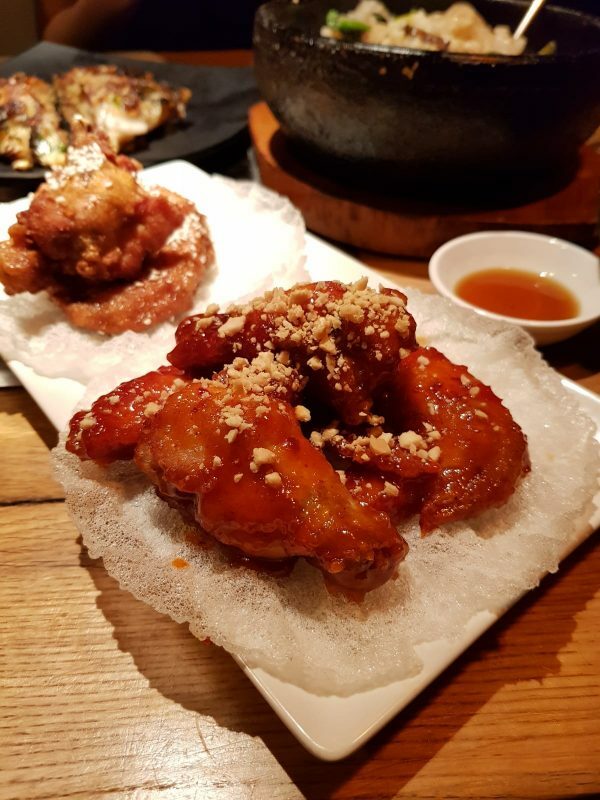 However, the sticky yangyeum Korean fried chicken (also £7.70) took top place. These were same deep fried chicken wings, this time in sticky, sweet chilli sauce with ground nuts, they were dreamy. The sauce was super sticky and sweet and the chicken tender yet juicy. The miso soup (£1.80) was a nice break between trialling dishes. A palette cleanser, but still tastier than I expected. 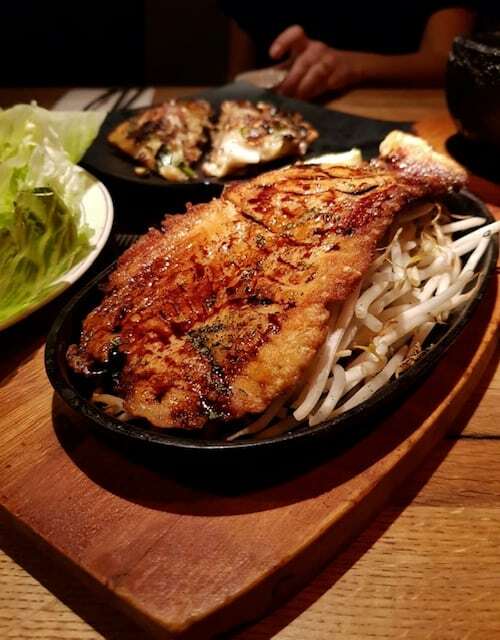 We loved the Salmon Teriyaki (£11.90) – soft and flaky, yet packed with rich flavour. It arrived on a bed of a la dente beanspouts, alongside a side of lettuce, cucumber, carrot and spicy bean paste for serving. You can create your own salmon wraps which was messy but worth it! The Tofu Bibimbap (£10.20), was delicious too. Soft rice, plenty of greens and veggies, a perfectly soft egg yolk, and crispy yet soft tofu, it was a fab mix of colours, flavours and textures. If you haven’t had it before, once mixed together, the egg coats quite a bit of the rice (if you stir it well), giving almost an egg fried rice feel. It’s so good! We love a bibimbap, and this one impressed. We could quickly see why this is a busy spot. The service is really friendly, the atmosphere is buzzy yet relaxing, and every dish we tried was fresh and delicious. The best bit is that it’s affordable too! 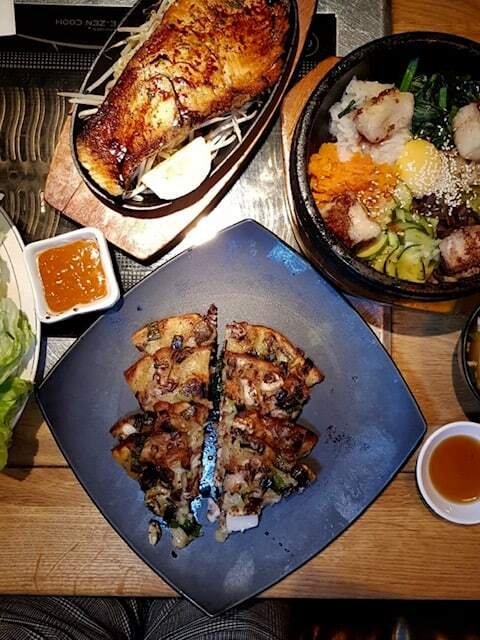 Lime Orange is a fantastic Korean restaurant in Victoria that definitely satisfies those cravings!